You've got the most popular Mariners hangout in the SoDo neighborhood near T-Mobile Park — at least according this Seattle Mariners Personalized MLB Pub Sign Framed Print. This M's sports decor is a must-have for that die-hard Mariners fan in your life (or for yourself, who're you kidding?). Hang it in your go-to fan zone where the baseball-watching magic happens or anywhere in your home or office that needs a little Mariner action. 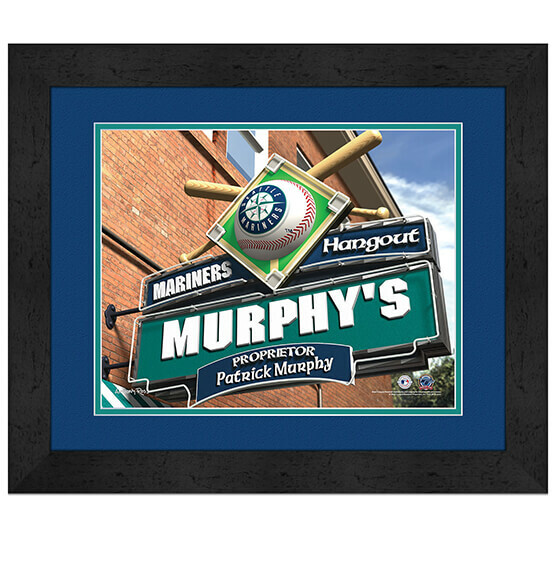 Quality MDF vinyl-wrapped frame, glass, crisply brilliant team colors and the Mariners logo are amazing additions to your baseball shrine. This piece arrives ready to hang thanks its convenient sawtooth hanger.